Our first 24 hours in Marrakech consisted of: a no show airport shuttle driver which then led to being ripped off by our taxi driver and subsequently the boy who carried our bags while leading us to our riad. Walking through a maze of overcrowded alleys with motor bikes weaving in between pedestrians, with fly-ridden stacks of stinking old sardines for sale on the side of the road. Having our reservation lost by our riad, and then being given a room that had a log of feces floating in the toilet. And last but not least, having our hands hennaed by force in the main square by gypsies. Welcome to Morocco. In all seriousness, after the culture shock of the first 24 hours wore off, Marrakech became one of our favorite destinations on our trip thus far. Despite the unappetizing way that meat, fish and produce are sold by street vendors (not refrigerated with dirt being kicked up onto it from the street), Moroccan food is incredibly delicious. 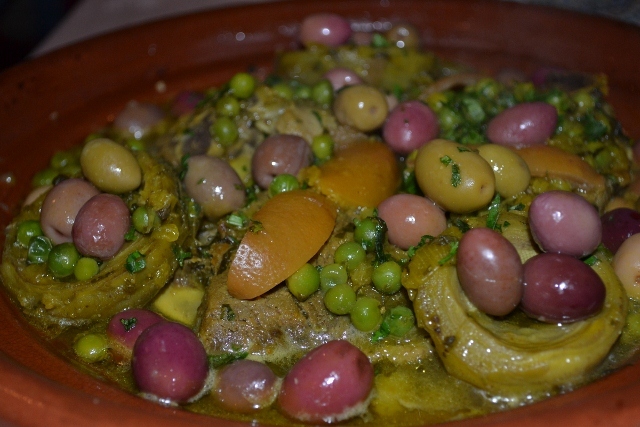 Couscous, tagines, lamb, Moroccan soup, root vegetables, figs, honey, and crepes, just to name a few. We quickly became unabashed at being “those” tourist who take pictures of their food. Documenting our meals with photos somehow makes the taste linger longer. And the mint tea. Oh. My. God. We must have averaged three or four pots per day. As a Muslim country, alcohol is taboo and not widely available (with the exceptions of being available to non-Muslim tourists in select hotels and restaurants). 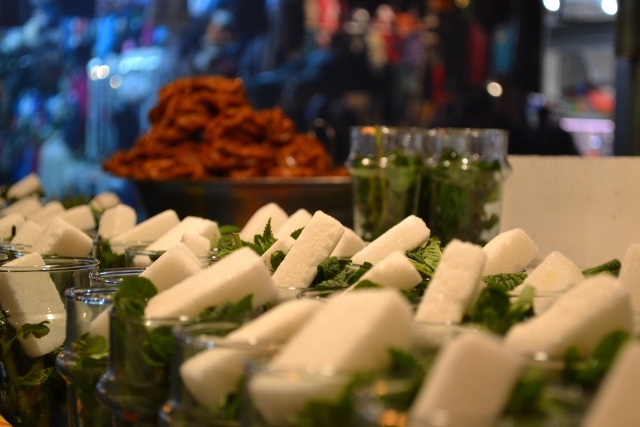 We found that mint tea is consumed in its place, and as ubiquitously as Coors Original at a Rockies game. 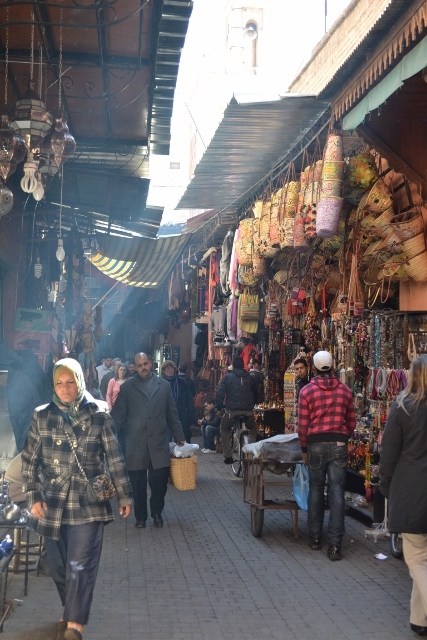 Anyone writing about Marrakech will tell you that you must visit the “souk” which is a vast network of shops and walkways. 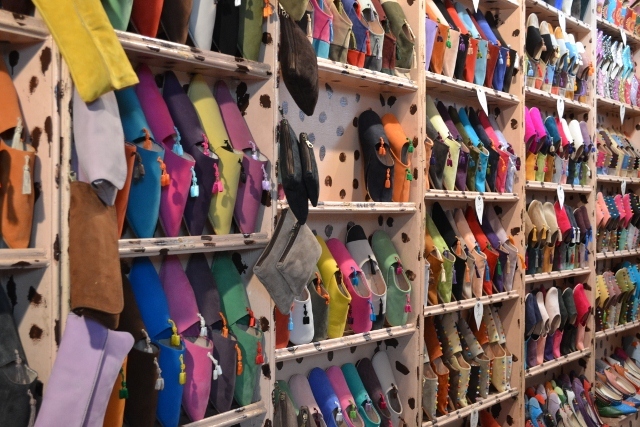 Within this labyrinth of merchants, you can find nearly anything from Nike running shoes to a live goat. Should you chose to venture to Marrakech one day, we suggest you remember these tips to help you survive the onslaught of vendors who, despite their friendly smiles, show very little mercy to unsuspecting tourists. 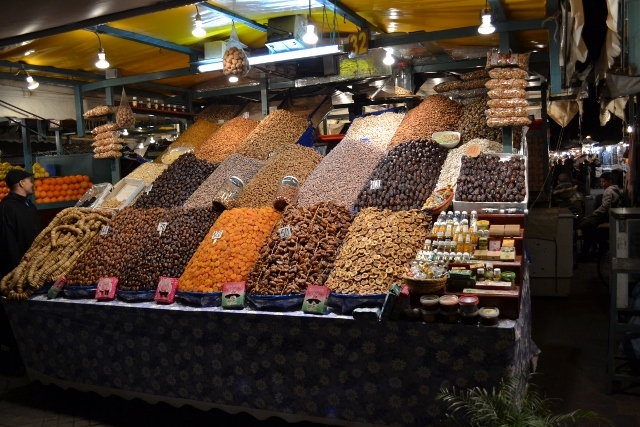 Tip #1: For your first visit to the souk, don’t bring your money. This will allow you to browse for items you might like to purchase, but prevent you from being persuaded to buy something you have no use or desire for. You can’t buy if you don’t have money. Tip #2: Learn these phrases “non, merci” and “la la, shakrun.” They mean “no, thank you” in French and Arabic, respectively. They won’t be enough to stop the vendors in their tracks, but just smile and keep walking. Tip #3: Before returning to the souk for some haggling, ask a local Moroccan working at your hotel or riad how much they would pay for each of the items you want to purchase. Keep those numbers in mind, and don’t pay more. Tip #4: You can always walk away. Vendors in the souk are good at what they do and have a whole arsenal of methods for convincing you to pay more for a product than you should. They will likely act offended, angry, or outraged at the prices you propose. If you are feeling too much pressure or are unhappy with the negotiation, smile, say thank you, and walk away. They may try to stop you, or they may let you go. Either way, no harm, no foul. It’s actually a lot of fun. Tip #5: Whenever possible, do your haggling in a language other than English. French is good because it is an official language of Morocco. Spanish is even better because most of the vendors understand and speak a few words, but are less comfortable with the language (anything you can do to gain an edge and make the vendor feel less confident is a plus). Americans pay double prices or worse, so if you must speak English be from “Vancouver” for a day. 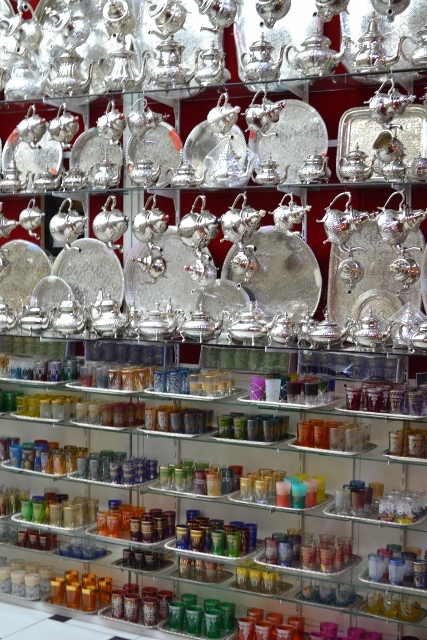 Tea sets for sale in the souk. Mike successfully haggled for one of our own! Adjacent to the souk is Djemaa el Fna Square. This is where much of the action in the city takes place. It is visited each day by thousands of tourists and locals alike. The square takes on two different personalities, which are literally day and night. 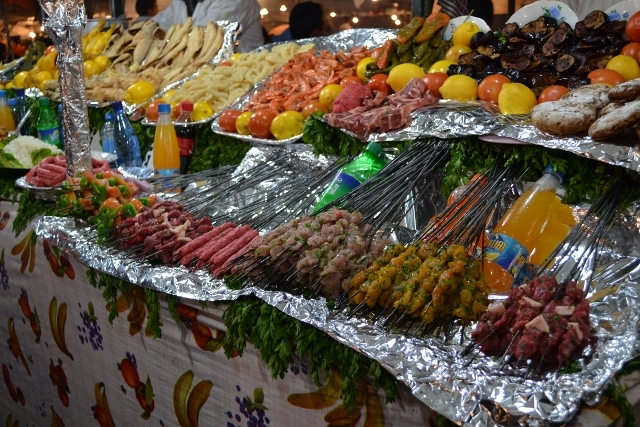 During the sunlight hours, Djemaa el Fna is lined by countless fresh juice and dried fruit vendors. The juice is a real steal at four Dirhams (about 50 cents) per glass! 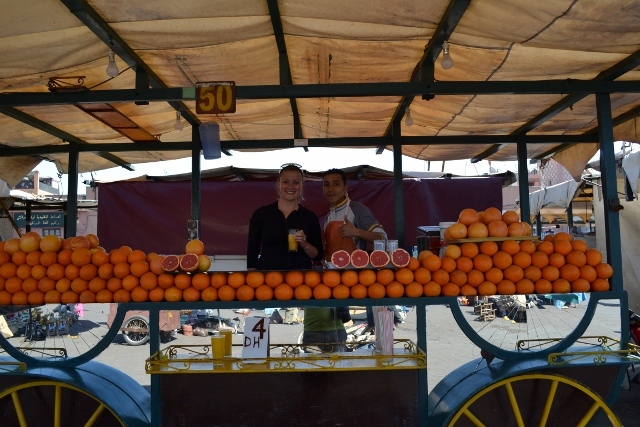 Amy with a juice vendor at Djemaa el Fna Square. A daily trip for us while in Marrakech. Each afternoon the square begins to transform into its nighttime form. More than 100 food tents are set up each evening for outdoor dining and groups of musicians and snake charmers create a very mystical environment. We made a video of the square coming alive one afternoon before dusk, which you may watch here. If you visit, be sure to watch out for the women offering henna tattoos; day or night, they will grab your hands and start tattooing before you get a grip of what’s happening. 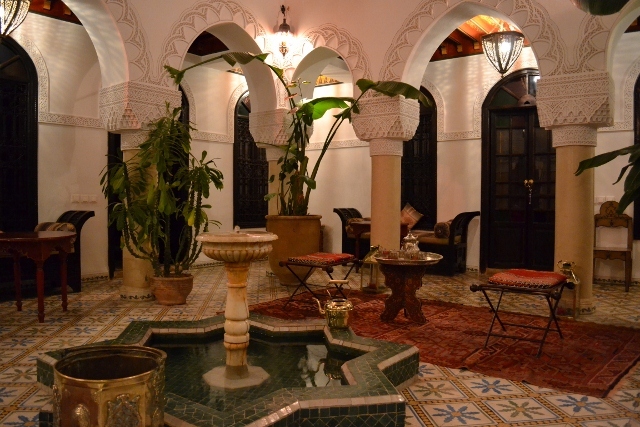 A riad is a traditional Moroccan house designed with a courtyard and fountain in the middle. 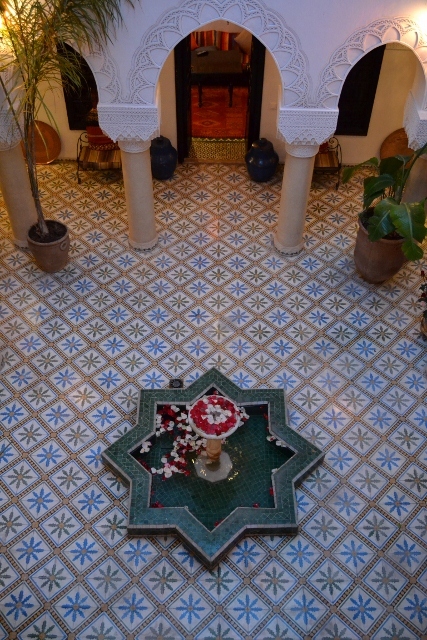 Although there are hundreds of riads in Marrakech alone, you may be hard-pressed to find one as their doors are plain and unsuspecting, but always open up into a beautiful and peaceful building. After a few hours of haggling at the souk and an evening in Djemaa el Fna Square, escaping back to the tranquility of a riad is the perfect end to a day in Marrakech. 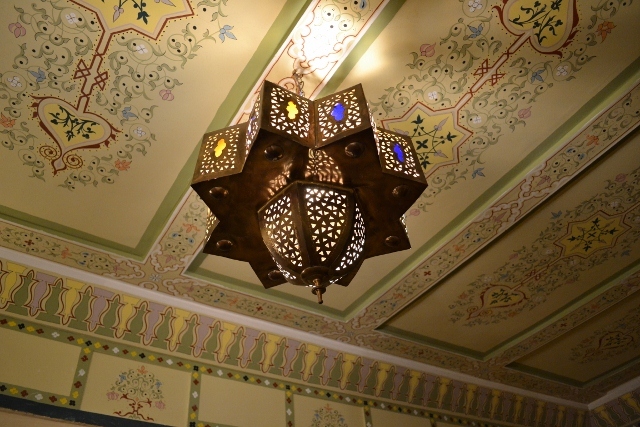 Despite the initial issues we had at our riad, everything was smoothed over and it turned out to be a fantastic place to stay. 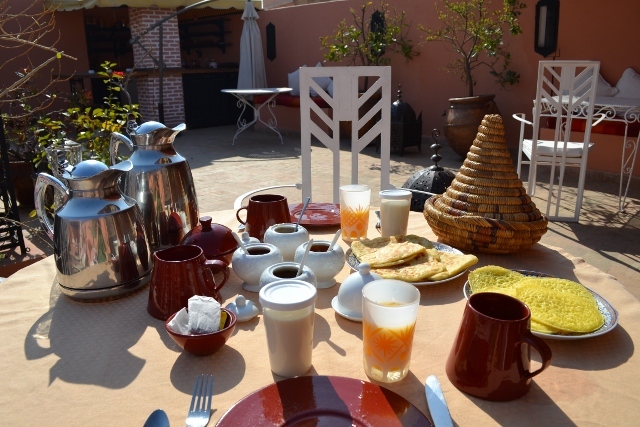 Breakfast each morning consisted of homemade crepes and harcha with a variety of preserves, fresh squeezed orange juice and coffee. Sitting in the courtyard or on the rooftop terrace always lowered our blood pressure after being out on the town. It was here that we first experienced the “adhān” which is the Islamic call to prayer. 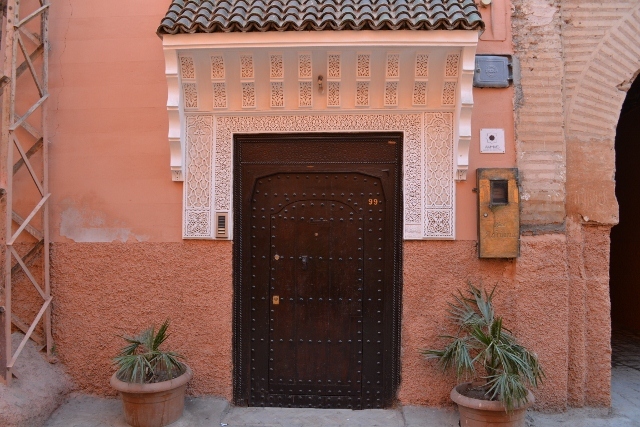 While we were familiar with this religious custom, Morocco was the first Islamic country that either of us had visited. Hearing the adhān five times each day was a part of the trip that we will certainly never forget. We made a video of the call, which you can watch here. It often begins as nothing more than a low distant hum, but soon becomes a 360 degree barrage of sound. For the most part, business continues as usual in the city, and everyone does not drop what they are doing and run to the mosque, but the call to prayer definitely creates a special feeling in the air. Marrakech was a crazy place, no doubt about it. It caught us off guard and left us feeling a little rattled. It was the first time we felt truly out of our comfort zone and in an entirely different world. But that is what traveling is all about. It’s ironic that you commented on this post because we were thinking of you in Morocco on that first crazy day and how much you would have been loving it;) You would enjoy the souk – so many colorful fabrics and materials. Hope all is well! Thanks Christina! We love your blog’s concept of simplify, enjoy, repeat. That is what a big part of our travels are about. Sometimes we all need a reminder.